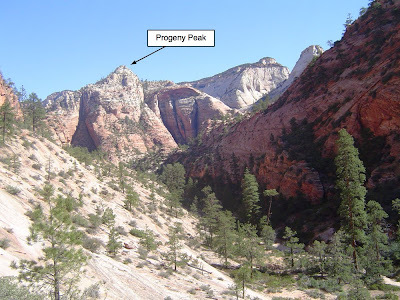 For a few years, I have been trying to hike to the top of a hill on the east side of Zion Natl. Park. 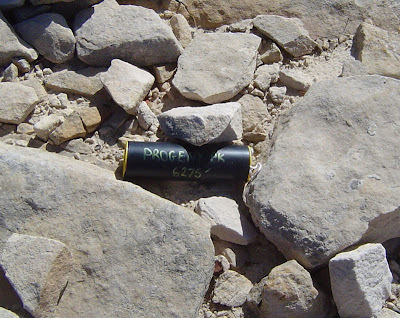 Here's a Google map centered on the peak (Lat: 37.221486, Lon: -112.931063). I've tried about 6 or 7 times, choosing routes from all sides, never reaching the top. It had become my nemesis hill. Last week I finally made the summit. I've also learned that it's called (unofficially) Progeny Peak. Here's a photo of it taken from a canyon on the south side of highway 9. I've never minded not reaching the top. I really enjoy hiking in that area. The landscape is beautiful and I often encounter very large big horn sheep. For me, it's a great way to spend some time, get some exercise, and enjoy the outdoors. I wanted to reach the top because I figured it'd have a great view, since it's taller than many of the nearby hills. I also thought it would offer a nice view of the tunnel entrance on the east side. I was right about both of these. The closeup is thanks to my camera's 12x optical zoom and image stabilization. The weather was great, with a high of about 93 down in the valley, meaning about 80 where I was. The view was also great. 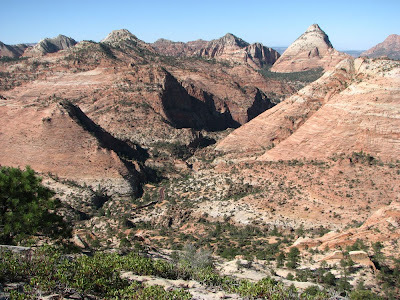 I had a terrific view to the south, over the slickrock that I've hiked many times on the south side of highway 9. 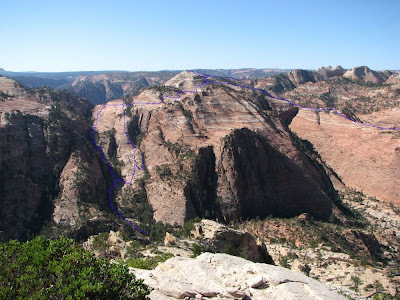 The photo below shows some of the routes I've hiked across that slickrock, including the scary steep slope up out of the canyon. The photos here show that, indeed, I could see the tunnel entrance. Cool. 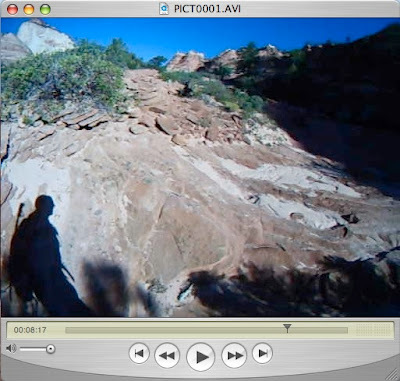 On this hike I experimented with using one of my video cameras to record the hike. I strapped it to my backpack shoulder strap. The video turned out pretty well, considering. 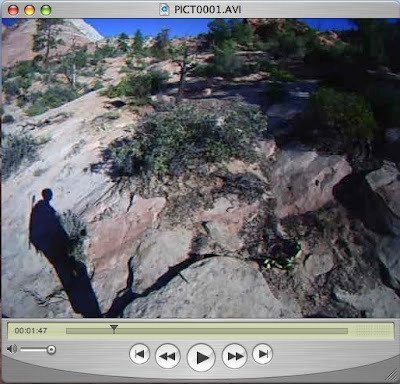 The camera's 170 deg FOV seems to use a fish-eye lens and that made the ground beneath my feet look more rounded than it was (mostly apparent when viewing the video since you can then see the terrain features warp as I walk past them). Here are a couple screen shots. I discovered afterward that the camera was directed too far downward. Next time I'll use a narrower FOV camera and pay attention to where it's pointed. The hike took about 1 hour and 10 minutes to reach the top. As often happens when I hike off-trail, when I got to the top, I realized that I could have taken a much easier route. I took the easy route back down. This was a terrific hike. I recommend it if you have some time and don't mind some class 3 scrambling on loose sandstone.